A SEVENTY-DAY MEDITATION retreat was recently organized at Panditarama Tenth-Mile Forest Meditation Centre, attended by about 90 foreign yogis. During the retreat, it became apparent that there are several common misconceptions regarding the nature of vipassana. U Hla Myint, one of the interpreters during the retreat, has consequently written two short articles which attempt to clarify the several topics that tend to puzzle yogis. U Hla Myint has had twenty-two years monastic training, 10 years as a novice and 12 years as a monk, during which time he gained the Lankara, Dhammacariya, and Bhivamsa degrees which are conferred within the Sangha. While still a monk (as U Vannitabhivamsa), U Hla Myint was a disciple of the Mahasi Sayadaw and Panditarama Sayadaw, and spent several years as an assistant meditation teacher at the Mahasi Meditation Centre in Yangon. This monastic training has given U Hla Myint extensive knowing of the Buddha's teachings and valuable insights into the teaching and practice of vipassanameditation. Since leaving the monk-hood, U Hla Myint has remained a close disciple of the Panditarama Sayadaw, and has acted as interpreter at meditation retreats in Malaysia, Singapore, England and the United States of America. "THE MAHASI SAYADAW'S instructions that in vipassana, the yogi must note all the material and mental phenomena relating only to the present is not in accordance with the Buddhist Canon." This remark was heard from a Tipitakadhara Sayadaw. A Tipitakadhara Sayadaw is a Sayadaw who has shown himself, through a series of very rigorous verbal and written examinations, to be a complete master of the Tipitaka, or the "Three Baskets" of the Buddhist Canon. The examinations for the Tipitakadhara degree are of such a high and unrelenting standard that in the past fifty years, only six sayadaws have been deemed worthy of the Tipitakadhara degree. As a long time disciple of the Mahasi Sayadaw, I had studied diligently the publications of the Mahasi Sayadaw, and I was at a loss as to what to make of the above remark. The Myanmar saying came to mind: "A lawyer who never errs, a doctor who never dies." With two leading sayadaws from Yangon's Panditarama Golden Hill Meditation Centre, I had gone to make a supplication to a Tipitakadhara Sayadaw to grace with his presence the opening ceremony of a special meditation retreat at Panditarama Tenth-Mile Forest Meditation Centre, 10 miles south of Bago (Pegu). The two leading sayadaws of Panditarama Golden Hill Meditation Centre and the Tipitakadhara Sayadaw knew one another well, and the conversation had turned to the missionary work of Mahasi Sayadaw, especially in bringing the benefits of vipassana meditation to thousands of yogis both in Myanmar and abroad. The Tipitakadhara Sayadaw then repeated critical remarks that had been made by one of the presiding sayadaws at the Sixth Great Buddhist Synod which had been convened in 1956. "Mahasi Sayadaw had initially attained only the degree of Dhammacariya and had not distinguished himself as a scholar. Later, during the Sixth Synod, Mahasi Sayadaw was given the responsibility of Principal Questioner, and only after this opportunity to study and learn the scriptures further, Mahasi Sayadaw became well versed in the Buddhist Canon." Because Mahasi Sayadaw had never been awarded the Tipitakadhara degree, it was difficult to argue the truth of the above remarks. "The other day, at an invitation lunch, the conversation had turned to the above points. A leading sayadaw of the Mahasi organisation had over heard, and immediately offered a rebuttal. "No," he had stated firmly, "Mahasi Sayadaw did not become a learned scholar only after the Sixth Buddhist Synod. The Sayadaw's treatise on vipassana meditation was written and published before this great Synod. It is a treatise deservedly respected by all scholars, and a close study of it reveals not only the Mahasi Sayadaw's mastery of pariyatti, or learning of the Buddhist scriptures, but it also reveals the Sayadaw's mastery and experience of patipatti, the actual meditation practices of the Buddha's teachings." As I listened, I breathed a sigh of relief that at least some one had come to the Mahasi Sayadaw's defence. The Tipitakadhara Sayadaw continued: "In this present day and age, no one dares to say anything critical of the Mahasi Sayadaw. In the fields of both learning (pariyatti) and actual practice (patipatti, the Sayadaw is honoured and respected, and acknowledged to be a great master. Previously, this was about as much as I knew about the Sayadaw, but not so long ago, I happened to look through the Mahasi Sayadaw's treatise on vipassana. Oh ... Only then did I realize for myself just how learned the Mahasi Sayadaw really and truly was. "I realized then that to say that Mahasi Sayadaw was not a scholar because he had never been awarded the Tipitakadhara degree was the same as saying that Einstein was not a brilliant scientist because he had never been awarded a doctorate degree from a university." anapana-sati, or meditation on the in-breaths and out-breaths, and that anapana-sati was a practice advocated by the Buddha as a method to be followed by his noble disciples, while the meditation on the rising and falling abdomen was a method only introduced by Mahasi Sayadaw, and not in accordance with the Buddha's teachings. Another topic that the book raised (The Tipitakadhara Sayadaw continued), was the Mahasi Sayadaw's instruction for moment-to-moment awareness of all the material-mental phenomena occurring within one's material body, as they occur in the present. All sights, sounds, smells, tastes, contacts, thoughts must be noted as they occur, and vipassana or insight wisdom arises as the yogi realizes the impermanence of all phenomena, that they rise and then pass away. The book however maintains that yogis must realize the facts of impermanence, suffering and no-self not only within oneself in the present, but also within the material bodies of others, and in the past, present and future. The book gave many references from the Buddhist Canon in-support of this, including the relatively well known Anatta Lakkhana Sutta. Hearing all this from a Tipitakadhara Sayadaw, mind and body became agitated as if watching a thrilling boxing match. The Tipitakadhara Sayadaw ended his remarks, however, and one was able to let out a sigh of relief. "But when I checked and studied all the references given in the book carefully, I discovered that the Mahasi Sayadaw, far from being wrong, was in the right, and that his meditation instructions were totally in accord with the Buddhist scriptures." We paid our respects to the Tipitakadhara Sayadaw and took our leave. His remarks nevertheless lingered in my somewhat unsettled mind. About a week later, I took the opportunity to inquire of the Panditarama Sayadaw about yogis noting only the material-mental phenomena within oneself and in the present only, as opposed to noting the phenomena in others and also in the past and future. As a long-time chief disciple, successor, and confidant of the Mahasi Sayadaw, Panditarama Sayadaw was acquainted with the Mahasi Sayadaw's teachings as no one else was, or could be. Panditarama Sayadaw replied first of all, that in his many years of teaching meditation, his experience had always been that detractors of the Mahasi Sayadaw had always been proved wrong, and Mahasi Sayadaw was invariably and finally proved right. Panditarama Sayadaw then explained as follows. "In vipassana meditation, one's own corporeal body gives disciples of the Buddha's teachings direct, personal and actual experience of the material-mental phenomena that constitute all existence. It is not possible to experience directly the material-mental phenomena of another's body, but one is forced to presume, compare, and decide based on one's experience and knowledge. This is clearly stated in the commentaries to the Uparipannasa Anupada Sutta. Thus, in vipassana, yogis should note and get direct personal realization of the material and mental phenomena taking place in one's own body. "Furthermore, regarding the future that has not yet arrived, it is clearly not possible to foretell exactly what phenomena will take. One can only make assumptions about what events are likely to happen. Therefore, it is equally impossible to directly, personally, and actually and correctly experience assumed, future phenomena. Equally clear is the fact that one must also make assumptions regarding phenomena pertaining to one's past lives. One can never directly, personally, actually and correctly experience them in the present. Even in this present life, regarding phenomena that took place some years, or some months, or some weeks ago, yogis are unlikely to be able to recall and understand correctly. Even for phenomena of just a few hours ago, immediately following a sense impression, such as seeing, hearing, touching, the yogi's impression is clouded by the conventional views that there is an ''I'', or "mine", or there is "man", "woman", and so on, and so the normal yogi will find it difficult, if not impossible, to penetrate through to the 'realization of the ultimate truths behind material-mental phenomena. This is why in the Bhaddekaratta Sutta, it is stated "paccuppannanca yam dhammam tatha tatha vipassati"; that one must note the material- mental phenomena relating to the present, as they occur, moment-by-moment, seeing, hearing, etc.. In the Satipatthana Sutta also, the disciple is admonished to note all material-mental phenomena as they occur in the present whether he be walking, standing, sitting, or lying down, thus, "gacchanto va gacchamiti..."; that is, when walking, know that one is walking, and so on. Noting diligently and without break, the yogi realizes that existence is suffering impermanent, and non self, and realizing this for himself, he knows intuitively that it is true for past and future too as it is true for the present, and being true for himself, he realizes it is true for others too. The yogi must not become confused about the method to be followed merely because the Anatta Lakkhana Sutta opens with these profound truths. There is therefore no foundation to the allegations that Mahasi Sayadaw's instruction to note material-mental phenomena of the present moment only is not according to the Buddhist Canon. For more details, the reader is referred to the published discourse by Mahasi Sayadaw on the Anatta Lakkhana Sutta. "IT IS QUITE wonderful that so many foreign yogis are meditating here. Are they developing anapana-satior mindfulness of in-breaths and out-breaths?" This remark was made by a visitor to the Dhamma-hall at Panditarama Tenth-Mile Hill Forest Meditation Centre, where there were nearly 90 foreign yogis in an intensive meditation retreat. The Panditarama Forest Meditation Centre is located in a bamboo forest about ten miles south of Bago. 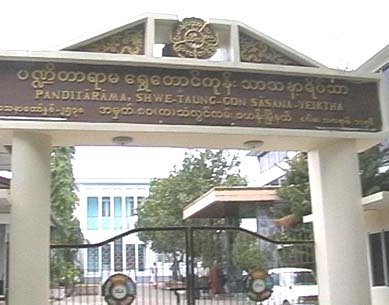 It was founded in 1993 by the Venerable Sayadaw U Panditabhivamsa of Panditarama Golden Hill Meditation Centre in Yangon. To celebrate the successful completion of residential cottages for yogis, Dhamma-hall, dining hall, kitchen and catering facilities, the intensive meditation retreat had been organized with about 90 foreign yogis participating. The retreat was opened on November 15, 1998 and will continue for 70 days until January 25, 1999. Visitors to the retreat are both surprised and delighted to find so many foreigners committed to the practice of the Buddha's teaching. Many become interested in finding out more about the practice of vipassana meditation. Questions that are commonly asked are: "Is not anapana-satimindfulness of the in- and out- breath, the same as vipassana-meditation, and therefore able to lead to realization of magga phala and Nibbana? ", "Is not mindfulness of in- and out-breath the same in essence as mindful ness of the rising and falling the abdomen?" Mary Shimoda had said: "Ko Hla Myint, a friend has phoned me from Yangon, and said that the Buddha-to-be became the Buddha, or was enlightened, through anapana-sati, or mindfulness of the in-and out-breaths. Is this not true?" The question took me by surprise and my heart began to beat a little faster. Yes, according to my knowledge of the Buddhist scriptures, Miss Mary Shimoda's friend was right. On the night immediately prior to his Supreme Enlightenment, the Buddha-to-be had developed deeper and deeper levels of concentration through anapana. In the first watch of the night, he attained pubbenivasanussati-abhinna, the Knowledge of Former States of Being, in the middle watch, he attained dibbacakkhu abhinna, the Divine Eye of Omniscient Vision, and in the third watch of the night, he realized comprehensively the truth of paticcasamuppada, or Dependent Origination, being the Conditionality of all physical and mental phenomena. "Yes," I replied, "the Buddha became enlightened and realized bodhinana through anapana." Mary Shimoda then had two other questions which kept my heart beating quicker than normal. "If that is so, Ko Hla Myint, why does the Mahasi Sayadaw ignore anapana-satiand teach instead mindfulness of the rising and falling abdomen. And another thing, rising-falling meditation method was introduced by Mahasi Sayadaw, and never taught by the Buddha. Only anapana-sati was explicitly taught by the Buddha. Is this not true?" I realized quickly I was inadequate to answer these questions to her satisfaction. I took an easy way out. I replied, "Sayadaw-gyi will come to Malaysia in April. I will ask the Sayadaw to explain, and I will contact you later." Regarding the last point, Mary Shimoda and her friend were quite right. The Buddha had on many occasions taught anapana-sati. In the Parajika, Mahavagga, and Patisambhida-Magga, for example, the Buddha had expounded the method and its benefits. The Buddha had never directly referred to the rising and falling of the abdomen. For these reasons, Mary Shimoda's phoned queries were of a nature to agitate the heart and exercise the mind. I had been a disciple of Mahasi Sayadaw. I had read and studied his books and lectures, and believe sincerely and deeply in the efficacy of the Sayadaw's meditation teachings. By keeping the rising and falling abdomen as the main object of mindfulness, but being mindful or aware of sights, sounds, smells tastes, touch, and thoughts as and when they became dominant, with continuity of mindfulness or bare awareness, unbroken and untainted by thinking or fantasy, one could realize for oneself the dual nature of existence as mind and matter, the fact of cause and affect, and higher levels of vipassana or insight wisdom. I myself had meditated intensively using this method. Thousands of other yogis, both in Myanmar and abroad had also meditated using the rising and falling abdomen as the main object of mindfulness or bare attention, and many had personally realized high levels of vipassana wisdom. Even now, nearly ninety foreign yogis were gathered in an intensive 70-day retreat based on the Mahasi Sayadaw's method. Clearly, all successful vipassana meditation methods had, ultimately, to be grounded in the Buddha's teachings. No method, however modified or introduced and taught by individual meditation teachers, unless so grounded in the Buddha's teaching, can succeed in helping yogis realize high levels of vipassana insight. For over forty years, Panditarama Sayadaw had been the chief disciple and successor to Mahasi Sayadaw, and had been teaching vipassana meditation based on the Mahasi method. Now, Panditarama Sayadaw has become perhaps the foremost and most successful among many Myanmar Sayadaws teaching vipassana who have won world-wide renown. When Sayadaw came to the Kuala Lumpur monastery where I was, I took the opportunity to put Mary Shimoda's questions to Sayadaw. Firstly, "Did the Buddha not attain Buddhahood through anapana-sati?" "Ko Hla Myint," the Sayadaw replied, "You have not studied the scriptures with the necessary attention to detail. It is true that the Buddha-to-be attained pubbenivasanussau-abhinna (Knowledge of Former States of Being) and dibbacakkhu abhinna (the Divine Eye of Omniscient Vision) in the first and second watches of the night through anapana-sati. But in the third and last watch of the night, the Buddha-to-be was no longer absorbed in anapana-sati, but had turned his great intellect to the doctrine of paticcasamuppada, or Dependent Origination. 'Through ignorance are conditioned the sankharas, the rebirth producing volitions or kamma-formations, and so on'. Then, just before the break of day, while meditating on the five khandhas, the physical and mental phenomena of existence, the Buddha-to-be attained arahatta-magga, arahatta-phala, and the Omniscience of the Buddha, the Supremely Enlightened. Thus, Buddhahood was won not through anapana-sati, but through mindfulness on the physical and mental phenomena of the five khandhas." Mary Shimoda's second question ("If the Buddha became enlightened through anapana-sati, why did Mahasi Sayadaw ignore anapana-sati and teach rising-falling method?") had been partially answered by Panditarama Sayadaw. However, Sayadaw's answer disconcerted me some-what because I had incorrectly told Mary Shimoda that anapana-sati had resulted in the Buddha's enlightenment. · Why Mahasi Sayadaw ignored anapana-sati, which was directly taught by the Buddha, but introduced rising-falling method'? · Is anapana-sati the same in essence as vipassana and meditating on rising and falling, and able to lead to mogga-phala and Nibbana? In answering these questions, Panditarama Sayadaw explained the teachings of the Mahasi Sayadaw as follows. Anapana-sati can take two directions. If the yogi strives to be mindful of the form or manner of the in-breath and the out-breath, then it is samatha meditation and leads to one pointed of mind. On the other hand, if the yogi notes the sensation of the in-breath and out-breath as it moves and touches, then it is vipassana meditation. The element of wind or motion (vayo-dhatu) is rupa or matter, while the awareness or consciousness of the sensation is nama or mind. Therefore, anapana-satican be considered as vipassana, and can lead to high levels of insight wisdom. However, in the Visuddhi-Magga, in the section on kayanupassana, or mindfulness of body, fourteen objects of meditation are discussed, and further subdivided into objects for samatha and vipassanameditation. In the Visuddhi-Magga, anapana-satiis presented as an object of samatha meditation. Consequently, if we are to instruct yogis to develop anapana-sati as part of vipassana meditation, we will be inviting much unwanted and unwarranted criticism and controversy. And neither Mahasi Sayadaw or myself would want to argue here that the Visuddhi-Magga, the rightly venerated classic, is at fault here. It has been said that by noting the rising and falling of the abdomen, yogis are distancing themselves from the teachings of the Buddha. The answer to this is a firm and definite "no". Quite apart from the success that yogis have achieved by noting rising-falling, there is much solid evidence in the Buddhist scriptures, such as Salayatana Vagga Samyutta, to show that the method is very much a part of the Buddha's teachings regarding mindfulness of the body, mindfulness of the dhatu elements, and mindfulness of the five khandhas. FOR MORE DETAILS regarding the above points, the interested person is referred to a discourse by Mahasi Sayadaw on the Malukyaputta Sutta, which has been published as a booklet. The Sayadaw wrote voluminously on the subject of meditation, and yogis are invited to make a study of the publications available. The correct answers were summarized and faxed to Mary Shimoda in Tokyo, and within an hour, a return fax was received, asking me to thank the Panditarama Sayadaw on her behalf for clearing up the points that had been troubling her. I too was much relieved and happy that Mary Shimoda had finally got the right answers; and hoped and trusted that she would pass, them to her friend. It is certainly a case for rejoicing that there are presently about 90 foreign yogis participating in an intense retreat at Panditarama Ten-Mile Hill Forest Meditation Centre. Here, yogis are noting the rising and falling abdomen as the main object of meditation, and assuredly, guided by the vast experience and wisdom of Panditarama Sayadaw, many are achieving high levels of insight wisdom. May all these yogis take home with them the wisdom, peace of mind and contentment that they have attained here, and may they spread the teachings of the Buddha through-out the world for the welfare of all beings. THERE ARE MANY fake lights of wisdom practice spreading actively in the world and this is a cause for concern. The following information was gathered from a Myanmar meditation teacher. Some time ago in a certain town in Myanmar, there was a prominent monk who taught his personal method of practice. He also wrote books critisizing Ledi Sayadaw and Mahasi Sayadaw. Shortly after these efforts, he had a fall. Panditarama Shwe Taung Gon Sasana Yeiktha's chief abbot, Sayadaw U Panditabhivamsa is of the opinion that such retributive effects can befall detractors and critics of Mahasi Sayadaw. 1) Anyone who attacks Mahasi Sayadaw will surely suffer a fall and that the method of practice promulgated by this person, will not last long as the burning of dried paddy straw. 2) The Mahasi method is liken to a balloon of hot air and the greater the one forces it down, the higher will it rise. 3) One who criticizes the Mahasi method is still aloof of the right path. 4) One who does not appreciate that the Mahasi method is correct is a like a 'blind person'. Mahasi Sayadaw faced numerous challenges when he first arrived in Myanmar to propagate the Dhamma. Many monks and the laity wrote articles in the press denouncing his method. Subsequent to these acts, they each suffered a fall. Later, the Mahasi method became more prominent against that of his detractors which slid into obscurity. Today, his critics are forgotten. In response to his critics, one of Mahasi Sayadaw's disciples published a book in Burmese entitled Mahaggharatana (The Great Precious Jewel) which sought to clarify and explain things. Most learned Burmese monks have a very high esteem and respect for Mahasi Sayadaw. The better learned one is, the higher will be his or her regard for the Sayadaw as he was very well versed in both pariyatti and patipatti. So skillful and learned was he! A well known meditation teacher of Myanmar urged one of the most learned of monks to read his book. When Sayadaw U Sumangala finished reading, he commented that the Mahasi method is the right method. He compared the quotations of the Tipitaka featured in Pa Auk Sayadaw's book against the original Tipitaka and discovered discrepancies in interpretation. Having scrutitnised Mahasi Sayadaw's writings and teachings intensely, he came to understand fully Mahasi Sayadaw's doctrine and affirmed them to be correct and pure. Some very thick books of Pa Auk Sayadaw in English which were sent to Myanmar from Taiwan have been banned and prohibited from distribution by the Maha Nayaka Sayadaws of the Myanmar Religious Affairs Department in Kaba Aye, Yangon. In response to an attack on the Mahasi method by one Pa Auk disciple, Sayadaw U Panditabhivamsa remarked, "One should not immerse poison into pure, clean water which is very useful. After being contaminated it will become useless. So don't put poison into pure, clean water"
Recently, Pa Auk Sayadaw went to Panditarama to pay respects to his teacher, Sayadaw U Panditabhivamsa. The Sayadaw greeted him with metta and karuna. He placidly advised his disciple thus, "One should drive minding one's own car in traffic and be in his own lane without disturbing others. When approaching a traffic light, to move only in green, to slow down and be ready to halt in amber and to stop in red. Transgressing these traffic rules will surely cause an accident." "To reach the desired destination, one must be in the right lane, be aware of the traffic regulations and be driving at an appropriate speed. Exceeding the speed limit may result in a ticket or an accident. Being out of one's lane, one may bump into other vehicles. Even if one is right and the other is wrong, one may also get into trouble. We must be careful about that." The Gift of Dhamma excels all other gifts.